Well, you've got the self-satisfied smirk down pat, I've got to say. That woman is just odious. Hmmm.... I don't see it. His eyes and mouth look quite shocked to me. But maybe not as pained as they should be. Thanks for the comments, everyone! 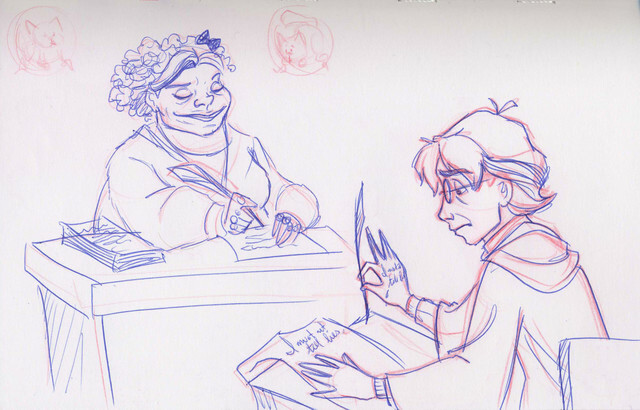 I love your sketches of Umbridge. The one of her with Bones and Fudge is particularly good because of the expression you put on her face. It's EXACTLY as I pictured it. I think Harry looks more tired than anything else...or maybe that's just how I'm feeling. I think I know what ":)" meant when he/she/it thought Harry looked bored-- It's his glasses that mar the surprised look. They cut right at the point where his eyelid would be if he was bored (I had to imagine the line gone to get the "truly surprised" look you were going for). I just want to slap Umbridge for hurting Harry like this!! She's a evil stupid toad.I hate her!! ": )," I think you mistook part of Harry's glasses to be a half-closed eyelid. Oh, oops, I didn't read this whole thing. C_Shacklebolt already said what I just did. I like the cat plates that are up on the wall. Nice to see that her office is like it was in the book. Its his glasses that make him look bored... The line drawn to repre3ent the part of the glasses that goes behind his ear... it looks like his eye is half closed, giving the appearance of boredom. I think she's got some family issues to sort out.